Yesterday I swam in the marine lake in the morning, before Barney the Storm came in. Apparently storms shall have names now, just like hurricanes, but ‘Barney’ described as a ‘gentleman storm’ by Radio 4, lacks a certain threatening something. I had an audience, which is not uncommon. It was a brisk 11.9°C or so, and yes, fellow Clevedon swimmers, the water in there was nearly a greeny-blue, just like the sea was not! 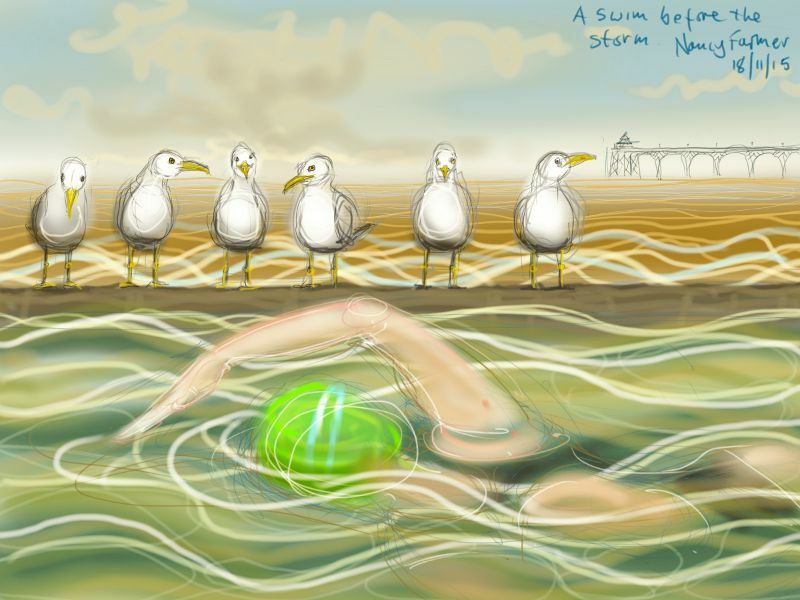 This entry was posted in Birds, swimming and tagged art, Clevedon, Clevedon Marine Lake, Clevedon Pier, cold water swimming, drawing, open water swimming on November 18, 2015 by Nancy Farmer.